Cuban Cigars - Glossary of Cigar Terms. 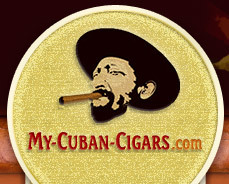 In order to start browsing cigar at my-cuban-cigars.com, you should probably get to know a few things first. Band - The paper ring containing the name of the cigar brand, glued to the unclipped head of the cigar with a vegetable-based adhesive. Binder - The part of the leaf that holds together the bunch of filler leaves. Blend - Various kinds of cigar leaf tobacco mixed together to include a binder, up to four kinds of filler leaves and a wrapper. Bloom - A white dust that that is formed on the wrapper of the cigar by the oils that are secreted from the cigar. You can use a soft hairbrush to brush the bloom off the surface of the cigar, but it is not necessary to do it. Bloom is the evidence of the maturity of the cigar. It is absolutely important to distinguish between bloom and mold. Mold is generally bluish-green and leaves a mark on the wrapper. It indicates that the environment in which the cigar is kept is too humid or warm. Blue mold - The disease of the tobacco leaf which is caused by the mildew fungi which form because of damp, muggy conditions. Bunch - The main or middle part of the cigar which is made up of two parts - the binder and filler leaves. Bundle - A method of wrapping cigars in cellophane paper, in contrast to a box. Bundles usually include from 25 to 50 cigars and are cheaper than cigars packed in a box. Cigars in bundles generally include seconds from premium brands. Cap - A circle-shaped wrapper tobacco leaf which holds the wrapper in place and is located at the cigar's head. The cap of the Cuban cigar has three or four layers, which sets it apart from counterfeits. Cutter - A device with a blade designed to cut the cap off the cigar (both hand- and machine made). Draw - The amount of air which a cigar smoker pulls through a lit cigar. It varies from too easy to tight. Filler - The tobacco leaves are the heart of the cigar that are mainly responsible for the taste of the cigar. Flag - The piece of the wrapper tobacco leaf at the head of the cigar (an alternative to the cap) which secures the wrapper and sometimes looks like a curly head or pig tail. Foot - The end of the cigar which is lighted. Hand-rolled - A cigar made by an operator by hand, using high quality wrapper leaves and a long binder and filler, in contrast to the leaves used in machine made cigar or cigar seconds. Head - The cigar's closed end which is supposed to be cut off. Humidor - A box (or even an entire room) which is supposed to provide the proper environment for cigars. The humidity inside the humidor should be 70%, and the temperature should be 70° F (21° C). Ligero - Light filler leaves (one of three kinds of filler leaves), named after the Spanish word "light". Long filler - Whole leaves (as opposed to cut-filler or chopped leaves) that are used for the filler. Machine made - A term used to describe cigars made by machinery and out of pieces of tobacco leaves. Mold - The wooden form where the bunch is put for a time to press and hold it in cigar shape. Ring gauge - The girst of the cigar measured in 64ths of an inch, so a cigar with a ring gauge of 50 is 50/64ths of an inch thick. Seco - A term which refers to the wrapper leaves which have been grown under a "tapado", a cheese cloth tent.